With over 12 years of experience rolling out CRM, HCM, productivity suites, and custom apps, the Appirio team knows firsthand that consistently delivering quality is the key to a strong service platform. Through our innate desire to produce quality over quantity, we’ve discovered that testing automation is an untapped treasure that can help us flawlessly deliver customized experiences. Testing automation has revolutionized our delivery process because it drives consistent, calculated releases. According to a Science Direct publication, “uncorrected errors become exponentially more costly with each phase in which they are unresolved.” As organizations and their processes become more complex, the correct use of a new cloud implementation becomes more valuable. Oftentimes, manual testing becomes labor intensive, because tests need to be run more than once. Testing Automation gives developers access to an interface that allows them to execute automated test scripts repeatedly and at scale. Automated testing works to validate that the new development is working correctly. It increases test scalability, while decreasing man hours and the length of those testing periods — this ultimately creates cost-savings while boosting the assurance of a quality implementation. Testing automation is critical for a faster, more successful delivery. Appirio is dedicated to providing the quality test automation that our clients have come to expect from our services. 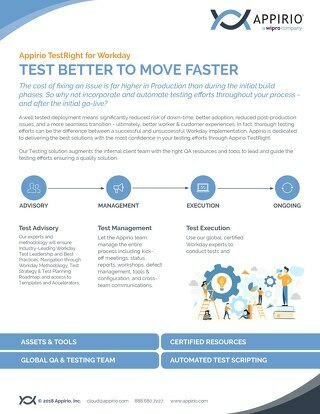 Appirio’s TestRight allows the user to perform various functional testing — like component, regression, UAT, and end-to-end — in an effective, agile, and cost-effective manner. Delivered applications are repeatedly tested and optimized for high performance,quality and load variants, which in turn gives our clients a great user experience. 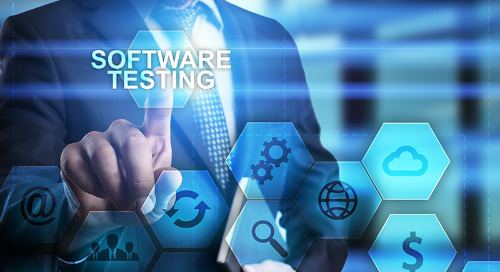 With TestRight, the client application is tested around extreme boundary conditions, giving us a proof of validation with each resulting test script. It also provides a real-time health check of the customized implementation. And includes sprint and project sign-off. This creates a sustainable ecosystem for our clients to develop efficient logistical practices. Appirio’s Test Automation Framework (which we’ve shortened to Appirio TestRight) contains four main components — Salesforce Assets, Tosca, AssureNXT, and Customization efforts. Salesforce Assets are comprised of a combination of open-source Selenium and Java, and other reusable components of the accelerator. 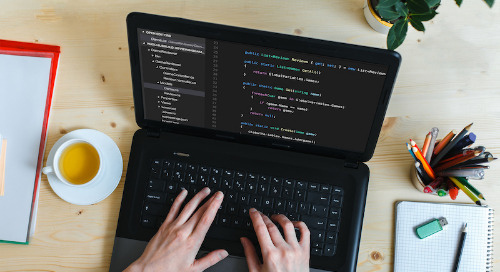 The Selenium and Java components help to specifically automate smoke and end-to-end regression tests with ease — minimizing time and coding effort. Selenium and Java work together to create test automation for post sprint and post release regression testing and deployment time sanity testing. They also help our developers discover where it’s imperative to run multiple user profiles and test data in test automation. The source code of this Selenium framework/Salesforce Assets is version-controlled by the QA Automation Team. It’s been integrated with Bitbucket and CI servers — integration with Appirio's Cloud Management Center is currently under development. Tosca, through Tricentis, provides the licenses needed to modify Tosca automation scripts. With this, AssureNXT allows us to customize and configure workflows and business models, using Rapid Test Design module. This is part of a bundled offering because it’s a Testing IP. Furthermore, our experts will work with clients to customize the accelerator to the needs of the Salesforce implementation. Appirio experts are readily available to customize and run test automation for your specific Salesforce implementation needs. Testing Automation can be beneficial for anyone implementing new cloud solutions in their organization. Specifically, large enterprises, complex infrastructures, developers, and testing teams working in Workday and Salesforce might find test automation highly beneficial. The most valuable part of the Appirio TestRight capabilities is that our very own Cloud Management and THRIVE experts are built into the essence of this solution, minimizing turnaround time on projects. Rest assured, Appirio follows best practices in all phases of the project to ensure quality deliverables. We can lower the cost of defects and maintenance after go-live through TestRight, while also detecting critical issues and requirement gaps early in development. We want to be who you turn to for all things cloud-related, that’s why we employ the brightest developers and smartest cloud experts in the world. Our team can help you determine your organization’s testing needs through a discovery and roadmap meeting. To learn more about our customizable cloud solutions, please visit our Appirio Hub. Learn the benefits of fixing errors through testing during the developmental process of your new Workday implementation. Find out what you need to know about the automated testing framework before you start automating your testing process. Take a closer look at automated testing, because it's helped us revolutionize our delivery process and drive consistent, calculated releases to our customers.